Kidney and liver are the main organs involved in the elimination of drugs. In general, the elimination capacity of the kidney is lower than of the liver, because of the smaller organ size and associated blood flow. Renal excretion can be limited by glomerular filtration rate in case of passive excretion or transporter capacity by total renal blood flow and in case of active secretion. Impaired renal function is a rather common condition in patients. Therefore, both dedicated studies in patients with renal impairment and pharmacokinetic investigations via means of population pharmacokinetics are routinely used in drug development to investgate if a dose adjustment needs to be applied in this vulnerable population. Kidney and liver are the main organs involved in the elimination of drugs. Both have a metabolic and a direct excretory capacity, although the first is predominant for drugs eliminated by the liver, while the most frequent mechanism of renal clearance is direct excretion of the unchanged drug or its circulating metabolites. In general, the elimination capacity of the kidney is lower than of the liver, because of the smaller organ size and associated blood flow. Renal excretion can be limited by glomerular filtration rate in case of passive excretion or transporter capacity by total renal blood flow and in case of active secretion. Impaired renal function is a rather common condition, with an estimated 30 million people in the USA having chronic kidney damage (CDC 2018). Kidney function is well known to decrease with age and in our experience mild or moderate renal impairment is the norm in study populations above 75 years. 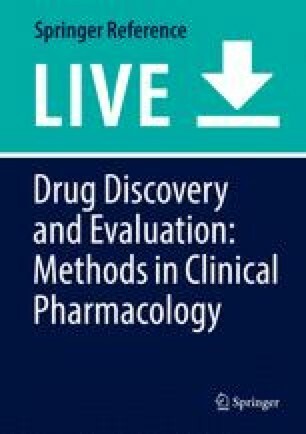 It is therefore necessary to evaluate the potential impact of changes in renal function on drug pharmacokinetics in many cases, and not only for prescribing information including dose adjustment, but also in order to conduct a clinical development program in large patient populations with adequate exclusion criteria guaranteeing safe drug administration. The main rationale to evaluate the impact of renal impairment is when a drug or its active metabolites are mainly eliminated by renal excretion, especially when a drug is intended to be given in patients with decreased renal function (e.g., elderly patients) or augmented renal function (e.g., critically ill patients) and exhibits a narrow therapeutic margin. In such situations, dose adjustment may be warranted to reduce the risk of adverse drug reactions/toxicity and therapy failure, respectively. However, impaired renal function can also affect nonrenal drug elimination and has also been associated with other changes, such as changes in absorption, transport, and tissue distribution. Also plasma protein binding might play a role through decreased drug protein binding due to low albumin levels. This is of relevance for drugs with high plasma protein binding (>90%) and that have a high hepatic extraction ratio (>0.7). Another indirect mechanism of impaired renal function is uremic plasma that inhibits enzyme or transporter activity. For most drugs, the evaluation will focus on the effect of decreased glomerular filtration, but it should be kept in mind that renal (drug) transporters, expressed in the basolateral and apical membrane of renal proximal tubules, play an important role in tubular secretion and reabsorption of drug molecules in the kidney as well. Thus, in case of active renal secretion of a transporter substrate, there is also a potential for clinical significant drug-drug interactions with perpetrators that inhibit those transporters like cimetidine (OCT) or probenecid (OAT and OATP). Finally, the possibility that a drug is eliminated during hemodialysis needs also to be considered. As a consequence, for most drugs that are likely to be administered to patients with renal impairment – including drugs that are not primarily excreted by the kidney – the respective pharmacokinetics should be assessed in patients with renal impairment to provide appropriate dosing recommendations. Both guidance documents on renal impairment of the FDA and the EMA (US FDA Guidance for Industry 2010; EMA 2015) outline several approaches to study the effect of renal impairment on drug exposure. One approach is a population PK analysis of sparse data in large scale clinical trials, which allows to compare patients with reduced renal function with the typical patient for a given indication. Some limitations of this approach are that it does not address patients that are voluntary excluded from such studies, which is generally the case for severe and end-stage renal impairment. Also some specific parameters like unbound drug fraction and circulating metabolites may need to be included in the evaluation, and the sample size should provide sufficient sensitivity. However, the approach may be very useful to confirm the absence of a treatment risk for patients with renal disease, especially when it is not easily feasible to conduct a specific study in renally impaired subjects without the clinical indication. When a specific pharmacokinetic study in subjects with decreased renal function is conducted, it can be done according to a “full” design or according to a “reduced” or “staged” design. In the first case, all degrees of renal impairment are included in the study. In the reduced design, the effect of severely decreased renal function in comparison to normal renal function is investigated first. If the results indicate that also other degrees of renal impairment may alter the pharmacokinetics of the study drug to a clinically relevant extent, the study should be expanded (staged design). This reduced design approach is considered to be useful only if no relevant effect is expected. Ideally, GFR should be measured with a marker that has no other elimination pathways (tubular secretion, extrarenal), does not undergo reabsorption, and can easily be measured. The gold standards are exogenously administered substances as a filtration marker (e.g., inulin, iothalamate, iohexol, 51Cr-EDTA, or 99mTc-DTPA) with quantification analysis in both serum and urine. However, in general, the endogenous marker creatinine is used, and in routine clinical practice mostly by estimation of the GFR calculated from the serum creatinine concentration (SCr). SCr with a molecular weight of about 113 Dalton is an amino acid derivative which is endogenously generated from the breakdown of creatine in muscle, distributed throughout total body water, and excreted by the kidneys primarily by glomerular filtration. The estimated creatinine clearance (Clcr) calculated by the Cockcroft-Gault equation (Cockcroft and Gault 1976). It is based on a correlation analysis between SCr and actual creatinine clearance measured from serum and urine creatinine concentrations. This correction is necessary because SCr depends not only on renal excretion but also on muscle mass and food intake. The estimated glomerular filtration rate (eGFR) from the Modification of Diet in Renal Disease (MDRD) study. It is considered to be a more accurate estimation and is being proposed by the US National Kidney Foundation (2012). The MDRD method was established in a larger population and takes into account additional patient-specific factors. It is standardized on body surface area and several versions of MDRD equations have been published. The example recommended by the Kidney Foundation is also provided in the FDA Guidance document. Both methods have limitations in patients with low muscle mass or with vegetarian diets, should be used in adults only, and can be biased by the fact that creatinine is also a OATPB1 transporter substrate. In addition, eligible subjects were required to meet the following inclusion criteria: to be 18–75 years old, to have a body mass index (BMI) of 18–30 kg/m2, to have laboratory coagulation parameters within normal ranges. Enoxaparin was administered once daily by subcutaneous injections at a dose of 40 mg for 4 days when the drug plasma exposure was anticipated to be at steady state. Venous blood samples were taken over a 5-day period to determine anti-factor Xa and anti-factor IIa activity, and the activated partial thromboplastin time. The schedule for blood sampling was as follows: Day 1: predose, and 30 min, 1, 1.5, 2, 3, 4, 6, 9, 12, and 16 h postdose; Day 2: predose (i.e., 24 h postdose 1) and 3 h postdose 2; Day 3: predose and 3 h postdose 3; Day 4: predose, and 30 min, 1, 1.5, 2, 3, 4, 6, 9, 12, and 16 h postdose; Day 5: 24, 30, and 36 h after dose 4. Pharmacokinetic analysis was performed by a noncompartmental approach with a full evaluation on Day 1 after the first dose and on Day 4; the maximum observed activity (Amax); the time of maximum observed activity (Tmax); the area under the plasma activity-time curve extrapolated to infinity (AUC, only Day 1); the area under the 24-h plasma activity-time curve (AUC(0-24)); the apparent terminal elimination half-life (t1/2λz) and the apparent total body clearance (CL/F). The differences between healthy volunteers and the three groups of patients with renal impairment were assessed on the logarithmic transformations of Amax, AUC(0-24), AUC, and CL/F for anti-Xa activity; 90% confidence intervals (CI) for log-transformed ratios in pharmacokinetic parameters of patients with renal impairment versus healthy volunteers. 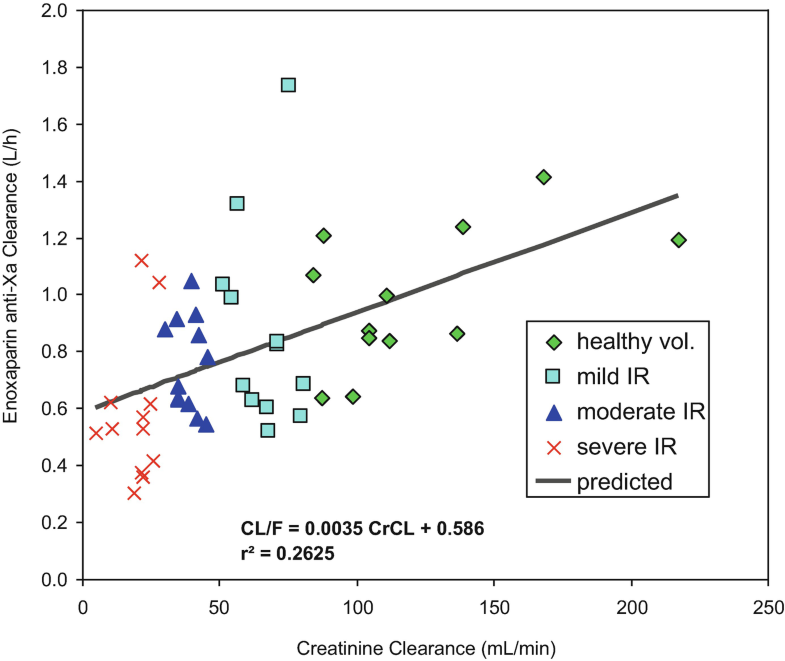 The relationship between total clearance and creatinine clearance was assessed using correlation and regression procedures. The steady state was established by comparing values on Days 2, 3, 4, and 5 for minimum observed activity (Amin) or Amax. The study design was in agreement with the regulatory guidance at the time of conduct. Since then, the classification of the groups for renal impairment has changed slightly due to guidance revision and guideline replacement, respectively. A repeat-dose regimen was chosen, because previous data had shown that steady-state exposure was not well predicted by single-dose pharmacokinetics. The 4-day duration was longer than necessary to achieve steady state in patients with normal renal function, because it was anticipated that a prolongation of half-life would occur in renal impairment, with a consequently longer time to reach steady state in these subjects. 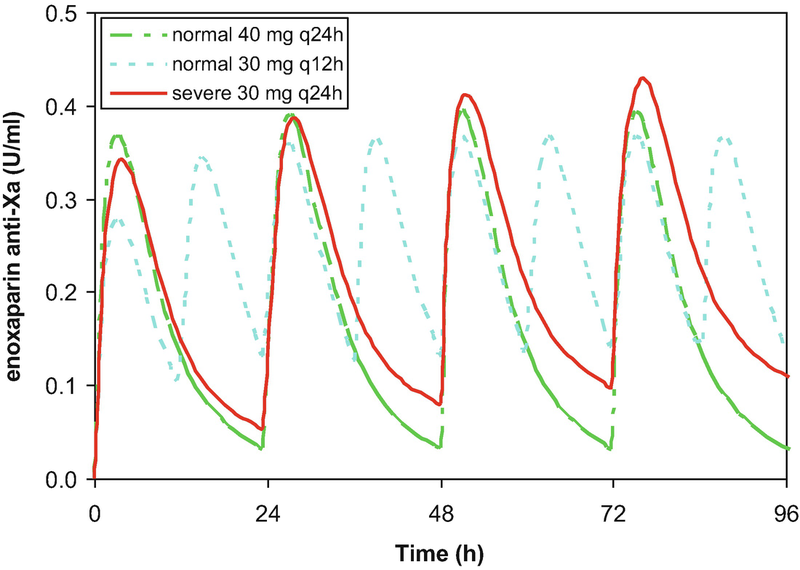 Nevertheless, the pharmacokinetics were also fully evaluated after the first dose in order to provide information for possible dose adjustment regimens. In contrast, the free fraction was not evaluated, because low-molecular-weight heparins act by binding to antithrombin III in plasma and nonspecific binding is known to be low for LMWH. For an application of free drug evaluation in a renal impairment study, see the chapter on “Protein Binding”. A full design was implemented for this study, because an effect of renal impairment on enoxaparin was expected. It allowed to select a control group that matched the overall demographic distribution of the patients, which can be more difficult with a staged design, mainly because subjects with severe renal impairment tend to be younger than the other groups. In this study, the mean (+SD) of the severe renal impairment group was 49.2 ± 15.2 years versus 63.9 ± 7.4 and 62.4 ± 13.3 years in the mild and moderate, respectively. The control group was 57.2 ± 14.3 years. Of notice, there was no individual subject-by-subject matching which would have needed 36 healthy volunteers instead of 12. This was given in by the fact that the means of the groups were to be compared and not by a paired test. Interestingly, more healthy volunteers would not have increased the power of the study. The number of subjects of 12 per group was expected to allow detecting clinically meaningful differences. It is generally not necessary to target a bioequivalence approach in special populations and many studies include only 6–8 subjects per group. The dose regimen was the same in all groups, 40 mg once daily which is the prophylactic regimen, because higher doses of the drug were known to be well tolerated. This would not have been possible with the dose regimen for treatment of deep venous thrombosis (1 mg/kg bid). For an investigational drug, it may sometimes be necessary to give a reduced dose, especially in the severely impaired group, for instance, when the therapeutic margin is low or still unknown, or the effect of renal function difficult to anticipate. In such cases, it is also possible to include the mild, moderate, and severe groups sequentially in order to select an appropriate safe dose for each group based on the finding in the previous group. An advantage can also be that it allows to compare directly the adjusted dose regimen to the reference regimen. But extrapolation to other doses remains problematic in case of non-linear pharmacokinetics. For a drug with dose- and time-independent pharmacokinetics, a single dose administration can be selected. An accurate evaluation of elimination half-life and AUC is in that case mandatory. The plasma pharmacokinetic profile on Day 4 of the study described above is shown in Fig. 1 and the associated pharmacokinetic parameters in Table 1. Rate of absorption was not different among groups, as shown by a similar Tmax (4 h on day 1 and 3–4 h on day 4). Amax was relatively high in the group with mild renal impairment on both Day 1 and Day 4. Because of slower elimination, predose trough values on Day 4 were increased with the degree of renal impairment, and Amax values in RI subjects became significantly increased after repeated dosing. Exposure on Day 4 was quite well predicted by Day 1 pharmacokinetics in healthy volunteers (+10% accumulation). The accumulation in patients with severe renal impairment was 29%, suggesting some underestimation of AUC and half-life on day 1 in the groups with longer half-lives because of a too short sampling duration (<24 h). The mean log-transformed anti-Xa AUC(0-24) was 20% and 21% higher in mildly and moderately renally impaired subjects than in normal volunteers. In severe RI patients, mean AUC(0-24) was on average 65% higher on day 4 (p < 0.001). The median apparent elimination half-life increased significantly with the degree of renal impairment (6.87, 9.94, 11.3, 15.9 h). On Day 1, CL/F was similar between healthy volunteers and subjects with mild or moderate renal impairment (1.00, 0.99, and 0.90 l/h), but there was a statistically significant 27% difference between healthy volunteers and severe RI (0.73 l/h). In the absence of accumulation, apparent plasma clearance was similar on Day 4 and Day 1 in healthy volunteers. In the other groups, estimations of CL/F tended to decrease over time. 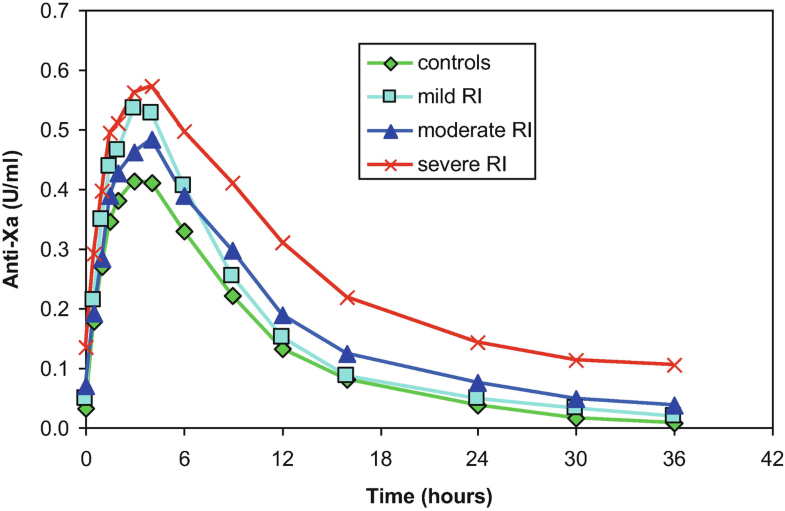 Differences across groups were therefore more pronounced on Day 4: −17% in mild and moderate RI and up to −39% in severe RI based on mean log-transformed values. On Day 4, anti-Xa CL/F was linearly although quite poorly correlated with the degree of the renal impairment as depicted in Fig. 2 (p = 0.0002, r2 = 0.2625). A more sigmoid relationship might have been more appropriate. The effect of renal impairment was also evaluated in a population PK study at a higher dose (Bruno et al. 2003). Study TIMI 11A was a multicenter trial of the safety and tolerability of two doses of enoxaparin in patients with unstable angina and non-Q-wave myocardial infarction. The study population consisted of 630 patients with unstable angina or non-Q-wave myocardial infarction. The only exclusion criterion relevant for the analysis was creatinine ≥2.0 mg/dL. 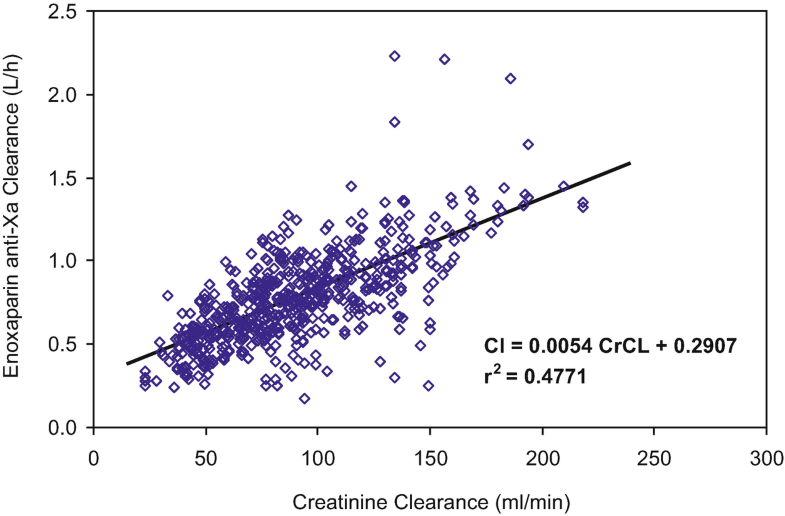 The median calculated creatinine clearance was 85.7 ml/min (5th–95th percentiles 41.2–152 ml/min). Fifty-one patients had moderate renal impairment (<50 ml/min), but only 4 severe (<30 ml/min). The effect of renal impairment on the clearance of enoxaparin was consistent with the observations in the PK trial (Fig. 3). Although the number of subjects in each group was rather low in the pharmacokinetic study, the effect of renal impairment was quite well estimated as confirmed by the population PK study and the residual variability in each group was low. This justifies the implementation of a model-based dose adjustment for renally impaired subjects rather than individual therapeutic drug monitoring and subsequent dose adaptation. For a low-clearance drug like enoxaparin, a decrease in clearance mainly translates into a prolongation of half-life, so dose adjustment can be accomplished by a reduction in dose or prolongation of dosing interval. In the prophylactic setting and depending on the indication and country, enoxaparin is approved with a 40 mg once daily or a 30 mg twice daily regimen. The data from the PK study were used to simulate different adjusted dose regimens in severe renal impairment (Fig. 4), and it was concluded that 30 mg once daily would lead to early and steady-state exposure parameters (Amax, Amin, and AUC0-24) similar to that in subjects with normal renal function treated with either of one of the standard regimens. This dose adjustment recommendation is now part of the Lovenox®/Clexane® labelling in several countries, among them the USA (FDA 2007). Similarly, a 1 mg/kg once daily dosing regimen is recommended for treatment of deep vein thrombosis in severe renally impaired patients, instead of 1 mg/kg bid or 1.5 mg/kg od.